DON Waney’s empire of crime keeps collapsing after his bloody end, which was ignited by the New Year’s Day killings in Omoku, Rivers State. Emenike Agamu (aka General Red Scorpion), who is said to be the fourth in-command in the Don Waney cult gang, yesterday surrendered his arms to security operatives in Owerri, the Imo State capital. 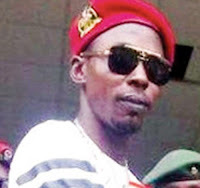 Members of the group were declared wanted and its leader, John Igwedibe (aka Don Waney) was gunned down in Enugu by security agents. His younger brother was shot dead days later. It was later found out that the group had bases across the Southsouth and Southeast, including the Imo riverine community which borders Rivers State. Agamu, who is among the suspected cultists declared wanted by the Rivers State government, surrendered alongside other Don Waney boys who had earlier rejected the government’s amnesty offer. Red Scorpion confessed that the militant group killed many people and blew up many oil pipelines. The group submitted explosives, rocket launchers and high calibre rifles, such as AK47, among others. Receiving the repentant militants, Imo State Governor Rochas Okorocha said the development would ensure lasting peace in the oil producing areas. He added: “Today, we are welcoming back our brothers and sisters who have remained in the creeks and forest for so many years, perpetuating all kinds of evil, killing and maiming human beings. “But today, glory to God, these our children have decided on their own to come back to the society and be part of the society. “They are doing so on their own, surrendering arms which they have used in committing criminal activities for what they called expression of grievances of different sorts. “We want to remove terror from Ohaji/Egbema. This is one of my campaign promises that I will change the lives of Ohaji/Egbema people. Terror is going out from the region. These are the children that drove away their traditional rulers, parents and brothers but today the story is different. We don’t want to hear the stories of Avengers and Don Waney again.